The Jewish establishment’s anxiety regarding the Jewish identity of millennials is not unfounded. The emergence of a new generation of Jews who were born and raised in open society with a freedom to choose their Judaism does not necessarily promise continuity. Furthermore, individualism, egocentrism and criticism of existing establishments, tendencies associated with Millennials, created room for additional concerns. These concerns seem, at face value at least, to relate most acutely to the collective dimension of Judaism – Jewish Peoplehood. 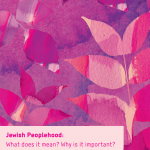 What are the unique challenges of engaging young adults with Jewish Peoplehood in today’s context? How do we respond to these challenges in practice? How do we assure the integration of the values of Peoplehood into the world views of our future leaders? How do we make sure that millennials embrace both a passion for the Jewish collective enterprise as well as a responsibility for its future?… and that their passion is followed by actions? Before highlighting some of the key points that emerged from this collection of essays it is worth noting that in general the story of engaging millennials with Peoplehood appears to be a success story. Millennials seem, in their own way, to embrace their version of Jewish Peoplehood. The organizations working with them have adopted creative learner centered approaches that enable and empower the Millennials to develop their own voice, without losing sight of the overall goal. This does not mean that a comprehensive solution to the millennial challenge has been achieved. Yet the fact that strategic, innovative and effective pedagogic approaches have been developed holds great promise to it. Millennials (see Kuperard, Olson, Fisher, Bloomfield) may reject old frameworks but the notion of Jewish collectivity as expressed through community, social activism and Tikun Olam resonates with them. They are not monolithic, hold on to multiple identities and pursue universalistic values. The search for meaning seems to be the central driving force to their engagement. Engaging millennials calls for a thoughtful structural-educational approach (Gorlin, Jacobson-Maisels, Raviv, Katler and Epstein) and educational innovation (Mali, Chertok & Mittelberg, Raviv). Jewish communities and organizations (Cousens, Okret, Herman & Fishman, Fisher, Eisenman, Chertok & Mittelberg) can adjust to engaging millennials on their terms and will actually benefit from this process. The dynamics of empowerment, partnership and pluralism reinvigorate the organizations throughout. Engaging through service (Eisenman, Kuperard, Fisher) and sustainability (Bloomfield) provide effective gateways to Peoplehood. Involving the millennials in the community decision making process and trusting their choices (Okret, Eisenman) may provide the key to their long term integration into the community. In conclusion this exchange of opinions should leave those concerned with the Jewish future optimistic. Millennials may be grappling with the right language to express their connection to Jewish Peoplehood but appreciate belonging to a larger whole. The organizations working with them seem to have developed creative strategies and pedagogies to engage them in the conversation and integrate their voice (voices) into the communal choir. It does leave one curious as to what kind of a Jewish world will emerge as the millennials take charge. Different no doubt, yet for sure more colorful. essays together, and all our articles’ contributors. I love hebs and i love hummus.